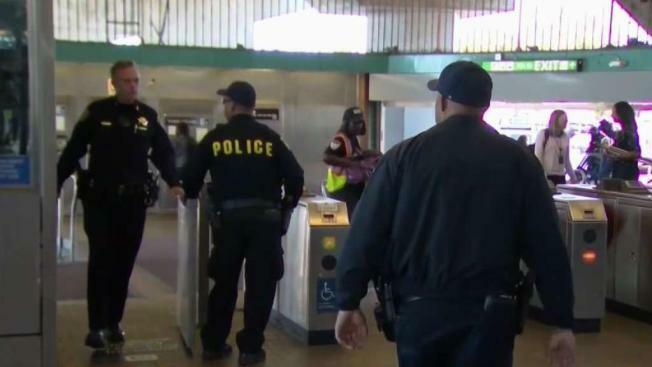 BART directors are set to hear a proposal to create a community ambassador program that would help beef up security at the transit system's stations. The program would be modeled after SF Muni's Transit Assistance Program, which trains unarmed employees to resolve fights on buses. After a summer of violent attacks at BART stations, some are wondering whether it will be enough. Two BART directors are hoping to bring community liaisons like that to the BART system in the latest push to make BART safer for riders. For BART Director Lateefah Simon, who is legally blind, the transit service is her lifeline, she said. "Without safe and reliable BART service, I don’t get to work, and my little one doesn’t get to school," Simon said, adding that safety concerns on BART are a personal issue for her, especially after the stabbing death of 18-year-old Nia Wilson on the MacArthur Station platform. "It’s not just up to sworn law enforcement to keep us safe; we’re all responsible for that." While BART police struggle to fill more than two dozen open positions, Simon is calling for a cadre of community to fill the void. "There can’t be a police officer in every car, but like the MTAP program in SF, which is again hiring folks to be second lenses of eyes and ears who come from the communities that we serve," Simon said. With MTAP, unarmed men and women are trained in de-escalation techniques and patrol Muni buses near San Francisco schools, where fights are known to break out. "It’s cheaper than hiring police officers," Simon said. "We know we need to hire police officers, but what I’m proposing is more community members to work in our system, to be our eyes and ears." One BART rider agreed a nonviolent approach is better than none at all. "It’s not a bad idea," Angel Mitchell said. "There’s a lot of stuff that goes on around BART." BART director Bevan Dufty is teaming with Simon to propose the community ambassador program during Thursday’s board meeting. Simon said they’re going to ask BART’s general manager and her team to look into how much it would cost to hire and train the workers.